Home Tags Posts tagged with "Ed Wehrheim"
Smithtown Supervisor Pat Vecchio (R) conceded that his challenger Edward Wehrheim has officially defeated him in the primary for town supervisor, bringing about the end to his storied 40-year reign. Councilman Wehrheim (R) held a razor-thin edge over Vecchio, 2,822 votes to 2,783 votes, when the polls closed Sept 12. After all 373 absentee ballots were counted by the Suffolk County Board of Elections, Wehrheim’s lead increased and he was declared the Republican Party candidate. The Suffolk County Board of Elections began counting the absentee votes Sept. 25 with attorneys from both candidates observing the process. Wehrheim said his counsel kept him briefed throughout the day, but a winner wasn’t clear until around five minutes to 5 p.m. That’s when he learned he was still leading by 83 votes. “The result is very gratifying as we put in two-and-a-half months of very hard work, it’s very gratifying,” the councilman said. Vecchio admitted despite the initial polling results that “it did, it did, it did” still come as a bit of a shock. However, the supervisor said he first congratulated Wehrheim on his victory in the hallways of Smithtown Town Hall just days after the primary. “I was resigned to the fact that I had lost on the night of the election,” he said. Vecchio is the current longest-serving town supervisor in New York, first elected to the position in 1977. To his credit, his years in office have been known as fiscally conservative ones for Smithtown, leading the town to have a Triple AAA bond rating. It’s been predicted there will be no tax increase for residents in 2018. Vecchio said that he’s no stranger to a close ballot count. He recalled that in his first general election he won by a slim 67-vote margin. He’s faced numerous primary challenges from members of his own party before. In 2013, he faced off against former town Councilman Robert Creighton and prior to that, Jane Conway in 2005. The key difference was in both of these primaries, Vecchio had decisive victories at the polls. Vecchio said that despite facing the reality of his loss, he hasn’t given much thought to what he will do after office. Wehrheim will face off against the Democratic candidate William Holst and independent Kristen Slevin in the general election. Wehrheim said he plans to take a few days to “catch his breath” before sitting down to plan his campaign strategy for the next five weeks. Wehrheim will share the party line with incumbents Councilman Thomas McCarthy and Councilwoman Lynne Nowick this November. McCarthy and Nowick, while not endorsed by the Smithtown Republican Committee, kept their lead on challengers Bob Doyle and Tom Lohman despite the absentee ballots. A Smithtown business owner has put her name on the November ballot to give residents a third option when voting for town supervisor. Kristen Slevin, 40-year-old owner of Yottabyte Craft Chocolate and Candy in Smithtown, has launched her own independent campaign for Smithtown town supervisor. A prior vice president of Swan Lake Civic Association, this is her first time running for political office. Slevin, a Smithtown resident and Hauppauge High School graduate, shed light on her jump from business owner to political candidate. “As a business, we feel we are a member of the community, we have a voice and we should leverage our voices for things we believe in,” she said of her business perspective. Slevin said after seeing her community get energized by the 2016 presidential election, she launched an advocacy group on Facebook titled Smithtown Election Watch 2017. “People had all this energy and enthusiasm to get involved in national issues, meanwhile our local downtowns are disappearing right before us,” Slevin said. The independent campaign platform focuses on fixing an “obsolete” town code, addressing blight in the downtown business areas and the creation of historic districts and town council districts. One of the first projects on her radar, if elected, would be to embark on a full review of town code, its policies and procedures, as the candidate said she had found it difficult to read through and impossible to search. If elected, she said she would consider introducing new tax codes to increase rates on properties with long-standing vacant buildings to encourage owners to either rent or sell. Slevin said other municipalities in New York and other neighboring states have adopted such programs. In addition to addressing blight, the business owner said she’d like to see Smithtown, Kings Park and Lake Avenue in Saint James be recognized as historic districts. The candidate said she’s not against the integrated development of mixed-use properties that combine retail space with apartments designed for students, singles and senior residents. Slevin said it’s her belief that mixed-use properties would provide a more diversified business base and community that over time would strengthen the local economy. Her platform also proposes splitting the Smithtown town board into council districts, similar to the Town of Brookhaven, to improve elected officials’ accountability. “If everyone had their own councilperson elected from their district, they are both aware of the issues in their districts and they can be held accountable,” she said. Slevin said she did weigh running for the town board seat prior to launching a campaign for supervisor. However, she felt that the town codes give the supervisor position significantly more power and control over other elected town officials, something she plans to remedy if elected. Slevin will face off in the Nov. 7 against Democratic candidate William Holst (D) and the winner of the still undecided Republican primary between incumbent Supervisor Patrick Vecchio (R) and Councilman Ed Wehrheim (R). The Republican primary results will not be available until after Sept. 25. No clear winner has emerged in the Smithtown Republican primary for town supervisor as a narrow 39-vote margin at the close of polls Sept. 12 left the outcome undecided, pending a count of absentee ballots. Smithtown Councilman Ed Wehrheim (R) holds a razor-thin lead on incumbent town Supervisor Patrick Vecchio (R), 2,822 votes to 2,783, in the unofficial election results posted Sept. 13 by the Suffolk County Board of Elections. LaLota said the board of elections has received 322 absentee ballots as of Sept. 13. He said he expects the county may still receive a few dozen additional ballots over the next week. Absentee ballots must have been postmarked by Sept. 11 and received by the county by Sept. 19 to be valid. “I am confident that we will remain victorious once they are opened,” Wehrheim said Wednesday morning. The councilman said his campaign, along with Smithtown Republican Committee Chairman Bill Ellis, ran an extensive absentee voter outreach campaign leading up to the primary race. LaLota said he anticipates by Sept. 25 the Suffolk County Board of Elections will have all the voting machines and paper ballots to be checked, and will have given sufficient notice to both campaigns in order to begin counting absentee votes. The process of counting paper ballots involves opening each absentee envelope, allowing the ballot to be reviewed by a board of elections inspector and campaign observers, potentially including attorneys representing the campaigns. If there are any objections to the validity of a ballot it will be recorded. The final outcome of the primary race may remain unknown until late September. Vecchio wrote the primary’s outcome was “still questionable” in an email statement, and that he was uncertain about the odds of being declared the Republican candidate after the absentee ballots were counted. This is not the first time Vecchio has been challenged by his own party in a primary for town supervisor. In 2013, he faced off against former town councilman Robert Creighton (R) and prior to that, Jane Conway in 2005. In both of these primaries, Vecchio had a decisive victory at the polls. If Wehrheim remains victorious, he will be running for Smithtown town supervisor on the Republican, Conservative and Independent party lines in November. Wehrheim currently has approximately $59,000 available in his war chest to spend on the general election, according to the 11-day pre-primary financial disclosure report filed with New York State Board of Elections. The winner of the Republican town supervisor primary will face off Nov. 7 against Democratic Party candidate William Holst and Kristen Slevin, running under her own None of the Above campaign. Two elected Republican officials will face off against one another in the Sept. 12 primary to see who will get the party line in this November’s election for Smithtown town supervisor. Incumbent town Supervisor Patrick Vecchio (R) is being challenged by Councilman Ed Wehrheim (R) who received the Smithtown Republican Committee’s official nomination at the party’s convention May 30. Vecchio, 87, is the longest-presiding town supervisor in the history of New York state. First elected in 1977, he announced his intention to seek re-election to his 14th term in May. Under Vecchio’s leadership, Smithtown stands as one of the most fiscally stable municipalities in the county with a triple-A bond rating. There was no tax increase on residents in 2017, and it’s predicted that there won’t be a tax hike in 2018 either. The Town of Smithtown was also the first municipality in the state to pass the Local Waterfront Revitalization Program, giving credit to Vecchio’s environmental record. The supervisor has also passed several initiatives to provide affordable housing for senior citizens. Wehrheim has served on the town board since April 2003 when he was first appointed by Vecchio to fill the seat left by state Assemblyman Mike Fitzpatrick (R-St. James). He now seeks to unseat the man who appointed him. 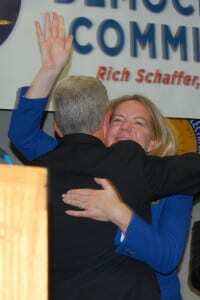 “I believe people are ready for a new beginning, and that’s across the gamut,” Wehrheim said. The councilman has served as the director of parks, building and grounds in the Town of Smithtown managing an $8 million budget and frequently works with other departments. However, he said over the last eight-to-10 years he’s seen a gradual deterioration of the parks and community spaces within the town. “We need to begin to levy our triple-A bond rating and low debt to begin to upgrade our parks and recreational facilities,” Wehrheim said. If elected supervisor, his other goals including bringing greater transparency to town government and the implementation of a business advisory council to aid in the creation of new development plans. Much of this, Wehrheim said could be possible with recent state funding given to the town. “We need an energetic, full-time town board to begin to wisely use that money to improve Smithtown wisely,” he said. Polls will be open for Sept. 12 primaries, 6 a.m. to 9 p.m. Town of Smithtown residents are eligible to vote in the supervisor race if a registered Republican, are at least 18 years old, have lived at the current address at least 30 days before the election, and not been in prison or on parole for a felony conviction. To double check if you are registered to vote, check on the state’s website at voterlookup.elections.state.ny.us/votersearch.aspx. Smithtown Councilman Ed Wehrheim (R) is leading the charge in an effort to shake up the town’s current government leaders. The councilman has served since April 2003, when Supervisor Pat Vecchio (R) appointed him to fill the seat left by now- NYS Assemblyman Mike Fitzpatrick (R-St. James.) In November, he’ll try to unseat the man who appointed him. Wehrheim said he believes the town board needs some major changes. Wehrheim said the existing town board has a lack of transparency between members, which he would no longer tolerate if he were at the helm. Of course, Wehrheim faces an uphill battle, as he’s running against a man who just recently had town hall named after him and has held the position for more than 30 years. But Wehrheim said he is the candidate with the most government experience, serving since 1971 as director of parks, buildings and grounds. Within his tenure there, he managed an $8 million budget and worked with the other departments in Smithtown frequently. During his four terms on the board, Wehrheim said he’s proud of the many projects he accomplished, including business development for the villages and hamlets. The councilman worked to renovate the Smith Haven Mall, negotiated deals to develop stores on Crooked Hill Road in Commack, helped Whisper Vineyards set up shop in Smithtown and more to help increase tax revenues for the town. “I have a good track record of making empty properties into something valuable and profitable for Smithtown,” he said. With his parks background, Wehrheim said he has also worked hard to keep the beaches, parks and baseball fields of Smithtown up to par. One major plan Wehrheim and his running mates, councilman candidates Bob Doyle and Tom Lohmann, hope to implement if elected is a business advisory council. “We would bring members from the chambers, civic groups and local development businesses to the table when we want to make new development plans,” he said. The plan would foster distinctive and attractive communities with a strong sense of place, according to Wehrheim. Ellis is an advocate for Wehrheim and said he has a lot of support within the Smithtown Republican Committee. “He is the best man for the position,” he said in a phone interview. Councilman Tom McCarthy shouts in anger during the meeting. Photo by Victoria Espinoza. The Smithtown Republican Committee was anything but united this week at their convention while deciding which GOP candidates to support for town board positions. It was revealed earlier in the week Councilman Ed Wehrheim (R) was a contender for the GOP’s Smithtown supervisor nomination, although at the committee’s meeting Tuesday night, May 30, it was clear leadership believed Wehrheim is not the only change they have in mind. After a roll call vote the results gave Wehrheim the comittee’s nomination instead of current Supervisor Pat Vecchio (R) who announced his intentions to run for another term last month. Incumbent councilmembers Tom McCarthy (R) and Lynne Nowick (R) also lost the comittee’s nominations for re-election from their party, with the committee voting to support Robert Doyle, a retired Suffolk County detective from Nesconset, and Thomas Lohmann, a Suffolk district attorney investigator. None of the incumbents came out of the meeting defeated though, and are determined to claim victory in the primaries this fall. Councilman Ed Wehrheim listens to a protester Tuesday night at the Smithtown GOP convention. Photo by Victoria Espinoza. Nowick was referring to the amount of proxy votes submitted — the majority of which went to challengers and not incumbents. She and other members of the party said the committee decided these changes last minute, and several members who sent in their proxy assumed the chairman would be casting their votes for the incumbents. Ellis is the current chairman of the Smithtown Republican Committee, and said before the meeting he was confident that many members of the party wanted these changes. “A lot of people support this,” Ellis said in a phone interview. Of the 180 members, Ellis cast proxy votes for dozens. As for the most controversial decision to try and unseat Vecchio, who was supported by the party in each of his previous campaigns over his 39-year tenure running the town, Ellis said he believes it’s the right decision. Ellis said there were several political reasons that led to the decision but would not go into any details. As for the current leader of the town, he’s not swayed at all by the turn of events. Marlene Wolke, who served as Vecchio’s secretary for many years, nominated him at the convention. Joanna Betts also spoke in support. “I’m perplexed why we’re doing this when the town is run so finely by him,” she said. But regardless of the divide in the party, Wehrheim came out the winner of the night, and thanked members for their support — despite having to wait several minutes for members to stop yelling in protest and calling for him to step down. It’s clear this primary will be anything but business as usual. “This is no different than an election in the U.S.S.R, it’s fixed in advance,” McCarthy shouted at the end of the meeting. “Mr. McCarthy I think needs to take a tranquilizer,” Ellis said in response. The incumbents won big on Suffolk County’s North Shore this Election Day, with only a couple real upsets at the county and town levels. Suffolk County Executive Steve Bellone (D) handily won a second term at the helm against his Republican challenger, lawyer Jim O’Connor, with 57 percent of the vote. He vowed that he would work hard for the voters. Though Bellone was the clear winner early on, O’Connor said he was proud of his campaign. “I think we talked about the issues that need to be talked about here on Long Island,” he said. Tricarico felt the same way. According to Tricarico, Republican absentee ballots outnumbered those of the Democrats, which he said boosts his confidence. Anker said her election demonstrates that each vote counts. Asked what could have led to such a close race, the legislator said she’s got the political cards stacked against her as a Democrat representing a largely Republican district. From there, it was smooth sailing. Kara Hahn (D-Setauket), the 5th District legislator, beat Republican challenger Donna Cumella, of Port Jefferson Station, with 63 percent of the vote. In the 13th, Legislator Rob Trotta (R-Fort Salonga) beat Kings Park Democrat Rich Macellaro with more than 70 percent of the total. In Huntington, Legislator Steve Stern (D-Dix Hills) won his final term in the 16th District against Republican attorney Tom McNally with 60 percent of the vote. “We understand what’s on the minds of our constituents, we listen to our constituents, and we deliver for our constituents,” Stern said. Also, Legislator William “Doc” Spencer (D-Centerport) took the 18th District against his challenger from the right, Grant Lally, after garnering 56 percent of the votes. Tom Muratore (R-Ronkonkoma), the 4th District legislator, and the 12th District’s Leslie Kennedy (R-Nesconset) were effectively unopposed for re-election and secured their next terms. Kennedy said she did not spend time campaigning and was pleased with the outcome. “I want to go home and go to bed so I can wake up tomorrow ready to vote on the Operating Budget Committee board,” she said. Brookhaven Town saw its supervisor, Ed Romaine (R), and its highway superintendent, Dan Losquadro (R), re-elected easily — Romaine won 72 percent of the votes against Democratic challenger Douglas Dittko and Losquadro beat out his own Democratic opponent, Jason Kontzamanys, with 69 percent of the voters’ support. The three incumbents running for re-election to the Brookhaven Town Board on the North Shore were returned to their seats. Councilwoman Valerie Cartright (D-Port Jefferson Station) beat Republican challenger Ed Garboski, the president of the Port Jefferson Station/Terryville Civic Association. She had 56 percent of the vote to his 44 percent. She has no small task ahead of her. If all of the election results stand, she will be the only Democrat on the Town Board next year, after her effectively unopposed North Shore colleagues Councilwoman Jane Bonner (C-Rocky Point) and Councilman Kevin LaValle (R-Selden) won re-election, as did South Shore Republican Councilmen Dan Panico and Neil Foley. But Cartright’s lone Democratic colleague, Councilwoman Connie Kepert, was ousted by Republican challenger Michael Loguercio Jr.
Over in Huntington, town board incumbents Gene Cook (I) and Susan Berland (D) were returned to the board after a four-way race with 27 percent and 24 percent of the vote, respectively. Democratic challenger Keith Barrett and Republican challenger Jennifer Thompson fell short, each garnering about 22 percent of the vote. Berland said she was “proud and humbled” to be re-elected. “I just want to keep doing good things for the people of the town and making the town the best place it can possibly be,” she said. Smithtown Town Board experienced a bit of an upset. Councilman Ed Wehrheim (R) was re-elected to one of two board seats, after receiving 31 percent of the vote, but his colleague Bob Creighton (R) was unable to battle back after losing a Republican primary to newcomer Lisa Inzerillo. Inzerillo was elected Tuesday night with 28 percent of the vote, as compared to Creighton’s 20 percent. The latter total was even lower than that of the lone Democratic candidate for Town Board, who lost after garnering just 22 percent of the vote. Inzerillo held a private gathering at her home Tuesday night and did not respond to requests seeking comment, but took to her Facebook page to thank her team. Rohma Abbas, Giselle Barkley, Phil Corso, Victoria Espinoza, Desirée Keegan, Kevin Redding and Eric Santiago contributed reporting. Experience and track record are the name of the game in this year’s Smithtown Town Board race, and on that note, we endorse Republican incumbents Bob Creighton and Ed Wehrheim. The two work well as a team, and say they have downtown revitalization high up on both their lists of priorities for another term. They’ve backed a proposal to restructure Smithtown government to lead to more accountability and cooperation. The plan would involve creating four commissioner positions that would oversee about five to six department heads, compared to the 26 department heads currently answering to the supervisor. That plan stalled due to opposition from Republican Supervisor Pat Vecchio. When it comes to economic development, both men encourage it. Wehrheim said he helped facilitate the redevelopment of the Smith Haven Mall and assisted in bringing Bob’s Discount Furniture to the Smithtown area. With Wehrheim’s support, Creighton also pitched raising the minimum wage, which eventually made its way into the town’s 2016 preliminary budget. It will be an uphill battle at the polls next Tuesday for Creighton, as he won’t be running on the Republican line. That spot belongs to Lisa Inzerillo, a Republican who narrowly beat him out in a primary election on a rainy day — the perfect storm for low voter turnout. Inzerillo did not show up for a debate at the Times of Smithtown’s headquarters. Democratic challenger Larry Vetter is a knowledgeable, nice man, who strikes us as creative, energetic, bright and pragmatic. It would be great to see him take on some government position. But we feel right now is not his time as councilman. Vote Creighton and Wehrheim on Election Day. Over the past several years, if a Smithtown Town Board vote resulted in a 3-2 tally, chances were incumbent Republicans Bob Creighton and Ed Wehrheim were the lone naysayers. Both electeds have been seeking re-election this fall, as political newcomers from both sides of the aisle have stepped up for their seats. Creighton, 77, came out on the bottom of a three-way Republican primary back in September, losing the GOP line on Tuesday’s ballot to both Wehrheim and Lisa Inzerillo, 50, of Kings Park, while still retaining a spot on the Conservative, Independent and Reform party lines. Meanwhile, Democrat Larry Vetter, 62, threw his hat into the race over the summer and has been vying to break the town’s all-Republican board. All the candidates, except for Inzerillo, sat down with the Times of Smithtown last week to discuss top issues facing Smithtown and what their plans were to address them if elected. Creighton said he hoped his record would speak for itself in his bid for another term, citing his background in law enforcement and private sector success before joining the Town Board in 2008. In the interview, both Creighton and Wehrheim discussed that familiar 3-2 split on the board and argued that dissension too often got in the way of progress. Earlier this year, Creighton, who is in his second four-year term on the board, took to a work session to propose that the town consider installing commissioner positions similar to those held in neighboring townships like Brookhaven and Islip, which he argued would streamline workflow and make department heads more accountable. Town Supervisor Pat Vecchio (R) was outright against the proposal and opposed it each time it was discussed before the board, which Creighton said stonewalled it from progressing. Wehrheim, who is running for his fourth term on the board, said he would use another term in office to stimulate economic growth in the town, specifically with downtown business revitalization and infrastructure repairs in mind. When asked how he planned on bettering his standing in the classic 3-2 Town Board split, Wehrheim said he would only keep doing what he has been doing — bringing business to every work session with hopes of spurring action. Wehrheim cited a recent legislative effort he championed alongside Creighton, adding that the two “went back and forth” over a minimum wage proposal for the town’s seasonal workers. That minimum wage hike was subsequently included in the 2016 preliminary budget in September. Vetter, the lone Democrat in the four-way race, said one of the key points that set him apart from the rest, in his first run for public office, was his “outside looking in” perspective coupled with his extensive background in environmental science and business. He centered his campaign on attacking the “Long Island brain drain” and fighting to keep young adults in Smithtown by making it a more vibrant place to live and raise a family. Vetter said that if elected, he would only seek out one or two terms before removing himself from the board because of his strong support for term limits. Earlier this month, Vecchio joined other marquee Republican names in Smithtown on the steps of Town Hall to endorse Inzerillo, flanked by councilmembers Tom McCarthy (R) and Lynne Nowick (R) as well as Suffolk County Legislator Rob Trotta (R-Fort Salonga) and state Assemblyman Mike Fitzpatrick (R-St. James). Inzerillo, however, did not respond to several attempts to organize a four-way candidate debate at the Times of Smithtown’s headquarters. She was also absent at other debates throughout the town, with the latest one a week before Election Day at the Smithtown Fire House. Three of the five members of the Republican-dominated Smithtown Town Board endorsed a political newcomer this week, as she heads into the November election with hopes of unseating an incumbent. Town Supervisor Pat Vecchio (R) stood beside councilmembers Tom McCarthy (R) and Lynne Nowick (R) on the steps of Town Hall on Monday to publicly endorse Lisa Inzerillo in her bid for the board, flanked also by other Smithtown-based elected officials. Inzerillo was one of two to land the GOP line in next month’s town board election, with 1,388 votes in a primary, alongside incumbent Councilman Ed Wehrheim (R), who received 1,830 votes. But fellow incumbent Councilman Bob Creighton (R) was left on the outskirts with 1,306 votes, forcing him to run on the Conservative, Independent and Reform party lines. Vecchio emceed the press conference as a means of bringing Republicans together to support members of their own party, but two fellow party members were noticeably absent from the dais. Both McCarthy and Nowick recalled times when they came out of Republican primaries victorious before earning their spots on the board and threw support behind Inzerillo with hopes of seeing her follow a similar path. Also throwing their support behind Inzerillo were state Assemblyman Mike Fitzpatrick (R-St. James) and Suffolk County Legislator Rob Trotta (R-Fort Salonga). Wehrheim, who also won the three-way primary with the most votes of the three, was not included in the endorsement and said in a phone interview he was standing behind his fellow councilman in Creighton, despite the candidate not garnering enough votes to get his name on the Republican line next month. Wehrheim and Creighton voted together on some of the town board’s more divisive decisions over the past several years, often being outnumbered 3-2. For that reason, Creighton said he did not expect the supervisor’s support as he sought another term. Both Creighton’s and Wehrheim’s seats on the board will be up for a vote come November, with the incumbents facing off against Inzerillo and Democrat Larry Vetter, who announced his candidacy earlier this year.